Thomas Patteson and I (Deirdre Loughridge) curate the Museum of Imaginary Musical Instruments. In this essay for the ever-fascinating Public Domain Review, we explore the peculiar lives of imaginary musical instruments – and with them the workings of speculative technology and unknown history of the imagination. Robert Fludd’s Temple of Music. One of the great seventeenth-century occultist’s contributions to the domain of speculative technology. From his Utriusque cosmi (1617) – Source. And as the instruments of the hand either give motion or guide it, so the instruments of the mind supply either suggestions for the understanding or cautions. Numerous museums are dedicated to musical instruments. In Berlin and Brussels, Paris and Phoenix, one can wander rooms lined with musical artifacts from many times and places. Strolling through these rooms, one might admire the exquisite craftsmanship of a Stradivarius violin or the opulent artistry of a French harpsichord. One might linger over forgotten curiosities like the tromba marina, or abortive experiments like Adolphe Sax’s seven-bell horn. One’s path might follow changes in the instrumentarium from Renaissance woods and metals to modern plastics and electronics, and the experience might lead one to wonder at the diversity of species born from the physics of vibrating strings, air columns and resonating bodies. Missing from such collections, however, is the peculiar class of what we like to call “fictophones”: imaginary musical instruments. Though these instruments, due to some measure of impracticality and impossibility, did not take sounding form, they were nonetheless put forth in the various means available to conjure objects in our minds: in writings, drawings, sometimes even in detailed schematics. One might suppose that imaginary musical instruments, deprived of physical reality, have no place in the cultural histories and heritages that a museum of musical instruments aims to illuminate and preserve. Yet in their own strange ways, imaginary musical instruments exist. What’s more, they have not merely shadowed or paralleled musical life; they have formed a vital part of it, participating in ways that show the fragility of the distinction between imaginary and real. No less than instruments you hold in your hand, imaginary instruments act as interfaces between mind and world, limning the edges of what we may think and do. Fantastic rendering of a hydraulic organ in Athanasius Kircher’s Musurgia Universalis(1650). Kircher would also write about the “cat piano”, see below – Source. Bacon’s sound-houses are hypothetical, an exercise in imagining what could be. Many readers today find them prophetic, and it is tempting to read the line about “divers instruments of music likewise to you unknown” as if its author had a foreknowledge of synthesizers and tape. But to read the sound-houses in this way displaces them from their own time, and the experiments with pipes, bells and string instruments from which Bacon extrapolated. By reducing their role to one of prediction, furthermore, it sets the imaginary at a powerless remove from the real. Rather than prophetic, Bacon’s sound-houses are emblematic of the power of imaginary instruments to act upon the world – of the magnet-like force they exert, attracting (or repelling) certain modes of thought and action. Bacon’s sound-houses illustrate one era’s technological imaginary becoming a later one’s reality – the course of things we’d likely expect. But the process can run the other way around as well. The tubo cochleato, for example, was described by Athanasius Kircher in his treatise on acoustics, Phonurgia nova (1673), as a device for amplifying the voice. Kircher’s student Filippo Bonanni also discussed the device in his book, Gabinetto armonico pieno d’istromenti sonori indicati e spiegati (Musical cabinet full of sounding instruments, shown and explained; 1722), where it appears among musical instruments both of common European use and from other parts of the world. As Bonanni explained, the tubo cochleato would amplify the voice much more than a straight tube; the evidence came from nature, from the fact that the ears of hares and other timid animals were formed in the spiral shape. But since it was extremely difficult for man to make a spiral so perfect as nature, it was near impossible to construct the tubo cochleato, and no one in Bonanni’s day used the device. Image from Filippo Bonanni’s Gabinetto armonico (1723) – Source. In fact, the tubo cochleato was purely speculative. But only in light of later theories of sound propagation would the design appear fundamentally flawed, the concept out of line with basic physics in addition to human craftsmanship. For Kircher and Bonanni, the instrument was real. Kircher’s reality, indeed, included many things we would consider fantastic (dragons, for instance, as John Glassie has discussed). As a measure of the gap between our reality and Kircher’s, the tubo cochleato (like the dragon) attests to the power of research and experiment to debunk the fabulous. At the same time – perhaps more disconcertingly – Bonnani’s book reveals the power of images and texts to define the real through a blend of speculative and empirical elements. Similarly hovering between the speculative and empirical is the curious device known as the cat piano. The earliest known image of a set of cats arrayed as sound-producing elements to be activated by the fingers dates to the late sixteenth century, that is, over a hundred years before the invention of the piano, at a time when it would more properly be called a cat harpsichord or clavichord. The image comes from an emblem book, Johann Theodor de Bry’s Emblemata saecularia mira et iucunda uarietate saeculi huius mores ita exprimentia ut sodalitatum symbolis… (1596), and shows a motley ensemble of animals and confused musicians. A subtitle to the scene, “there is no music sweeter to Midas’s ears”, alludes to the Phrygian King whose punishment for preferring Pan’s pipe to Apollo’s lyre was to have his ears turned into those of a donkey. First known image of the cat piano from Johann Theodor de Bry’s Emblemata (1596) – Source: courtesy of Robert J. Richards. be arranged in a row with their tails stretched behind them. And a keyboard fitted out with sharpened nails would be set over them. The struck cats would provide the sound. A fugue played on this instrument – when the ill person is so placed that he cannot miss the expressions on their faces and the play of these animals – must bring Lot’s wife herself from her fixed state into conscious awareness. The cat piano, or “Katzenklavier”, as depicted in Gaspar Schott’s Magia universalis naturae et artis – Source. Illustration of the cat piano from La Nature, Vol. 11 (1883) – Source. then an air-current inflates my chest, a current skillfully controlled, which carries the Ray sharp out of my lips. I want to be silent, but I cannot. I am nothing but an instrument in the organist’s hands. His touch upon the keyboard is like a valve opening in my heart. The keyboard finds yet more sadistic form as a species of organ in the film The Adventures of Baron Munchausen (1988). Called the “Torturetron,” the instrument sends spikes into people’s sides so as to add their moans to the tones of its more conventional ranks of pipes. “Pas un son ne s’échappe…”, an illustration by Georges Roux from the first edition of Jules Verne’s Hier et demain (1910) – Source. Verne’s organ and the Torturetron exemplify the capacity of imaginary instruments to serve as “cautions” – cautions we would do well to heed in this age when so much of what we do takes place through keyboards and other interfaces that remove us from the carrying-out of our commands. The note of warning is one imaginary instruments have sounded with growing regularity since the nineteenth century, as the wonders of new technologies have stoked fears about their consequences for humanity. Amidst the rise of industrial machinery, for example, the French caricaturist J.J. Grandville envisioned a fantastic “steam concert” of intelligent, steam-powered instruments. The program, described in his book Un autre monde (1844), features such pieces as L’Explosion, mélodie pour 200 trombones (The Explosion: a melody for 200 trombones) and La Locomotive, symphonie à basse pression, de la orce de trois cents chevaux (The Locomotive: a low pressure symphony with 200 horsepower) and Le Moi et le Non-Moi, symphonie philosophique en ut (The Self and the Non-Self: Philosophical Symphony in C). At once fascinating and disturbing, Grandville’s anthropomorphic instruments express a fundamental ambivalence about the development of increasingly powerful and autonomous technologies. Illustration from J. J. Grandville’s Un autre monde (1844) – Source. “Ask any good Frenchman … what he understands by progress,” Charles Baudelaire observed in 1855, “he will tell you that it is steam, electricity, and gas lighting.” Today, one might say that what we understand by progress is digital networks, mind-machine interfaces, and biotechnologies. These have been prime stimuli to twentieth- and twenty-first-century inventors of imaginary instruments such as Pat Cadigan, who detailed brain-sockets for music video production in the cyberpunk novel Synners (1991), and Richard Powers, whose Orfeo (2014) envisioned music encoded in DNA. Grandville, Cadigan, and Powers illustrate not only a cautionary strand in imaginary instrument design, but also a distinct temporal orientation: each places his or her inventions in the not-too-distant future. In the history of imaginary musical instruments, the emergence of a futuristic orientation can be dated quite precisely. The turning point occurs with Louis Sébastien Mercier’s novel L’An 2440 (The year 2440), published in 1771. The utopian premise of the novel is reminiscent of Bacon’s New Atlantis: here too, an outsider encounters a society where experimental research is undertaken for the benefit of mankind; in the field of acoustics, a device made of springs is capable of imitating all manner of sounds, and is used to dissuade the King from going to war by letting him hear the horrors and grief it would cause. But where Bacon’s sound-houses were found in a contemporaneous foreign land, Mercier’s springs exist in their author’s home city seven hundred years in the future (Paris in 2440). 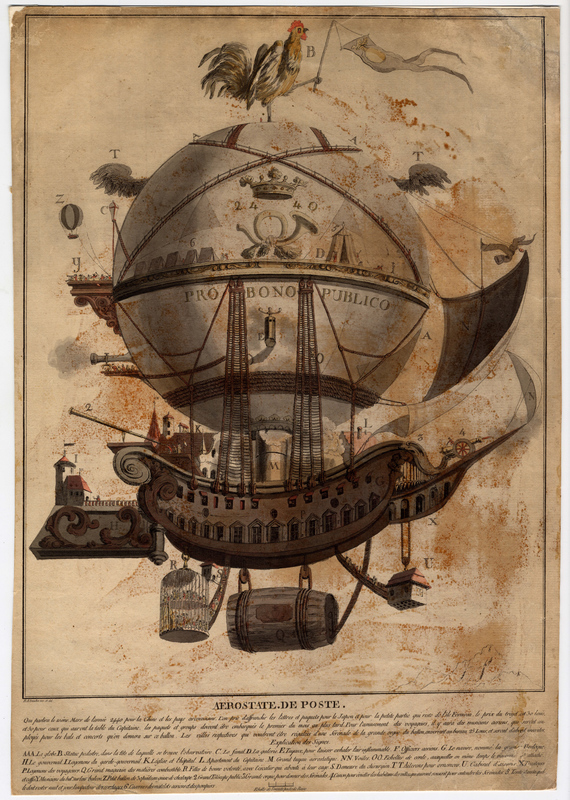 The novel, generally considered the first significant example of fiction set in the future, promptly inspired other futurological visions, such as the fantastic image of a twenty-fifth-century postal balloon shown below, which would deliver mail via the air and have a pipe organ built into its bow. Print by Balthasar Anton Dunker, probably dating to 1784, depicting the twenty-fifth-century postal balloon – Source. The imagination is often figured as a site of infinite possibility, free to create without regard to material limitations. But touring the museum of imaginary musical instruments suggests that there are in fact certain grooves that form over time to channel the course of fantasy. Futuristic imaginary instruments flow along one such groove. The future orientation of the imagination directs its energies to the technologies synonymous with “progress” in the present – an effect that starts to show its peculiar limitations when one looks back at projections like the hot air balloon of 2440. This particular channel for technological fantasy was not always so deep. Before the eighteenth century, imaginary instruments typically appeared either in a contemporaneous foreign land (like Bacon’s sound-houses) or in the past, as devices that existed but had been lost (like the Tubo cochleato). The museum of imaginary musical instruments thus illuminates not only the intersection of reality and fantasy, but also the unknown history of the imagination. It reveals numerous paths of inventive thought not taken – paths covered up by years of “progress,” but which, when cleared off, might yet lead us back to something new. It’s good to see how the progression of musical instruments changes through the years.